Like you, I love Chinatown and never tire of seeing it again and again. I tend to think this great film noir as a Shakespearean tragedy and that makes me less bothered by trying to unravel its complexities. 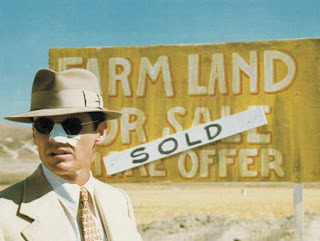 Gittes great tragic flaw is his pride, his belief in his own powers. And yes, his vision is limited. He can't see beyond the nose on his face and, because he doesn't know he's so blind, he doesn't know when he's being manipulated. I don't know if Towne had Lear in mind but there are some parallels. Weird, i was just watching this last night and am watching Repulsion right now. Just discovered this Blog, looking forward to keeping up with it!